KILL DEVIL HILL – Debut “Voodoo Doll” Song Online! KILL DEVIL HILL have debuted their new song “Voodoo Doll” online. The band will release their new album on May 22nd through Steamhammer/SPV. Check out the new track HERE. Den Headz, before their headlining performance at this year’s Download festival, British heavy heavy metal legends BLACK SABBATH will perform in their hometown of Birmingham for the first time in thirteen years in an intimate homecoming show at the O2 Academy on Saturday, May 19. A donation to Help for Heroes will be made from the proceeds of the show. As previously reported, BLACK SABBATH has been confirmed for this year’s edition of the Lollapalooza festival, which takes place on August 3-5 at Grant Park in downtown Chicago. BLACK SABBATH was supposed to tour the U.S. this year as part of a worldwide trek in support of a new album, but guitarist Tony Iommi’s cancer diagnosis put those plans on hold. Greek classic metal band MARAUDER have joined forces with Pitch Black Records. Having recently celebrated 22 years since the band was formed, with a number of metal anthems composed throughout the years and having established themselves as one of the most respected acts of the Greek metal scene, MARAUDER are now back with their fifth album, “Elegy of Blood”. 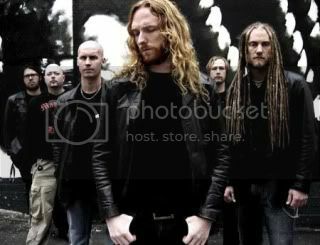 Century Media Records has renewed their deal for the 3rd time with Swedish melodic death metal legends, DARK TRANQUILLITY. This influential band from Gothenburg released their first album on Century Media Records in 1999, and since then has released 6 albums, plus 2 DVDs and a handful of special releases. Classic heavy metal band STRIKER has inked a worldwide deal with Napalm Records. The Canadians’ new album, “Armed To The Teeth”, will be released at the end of July. In addition, the CD “Eyes In The Night” and the “Road Warrior” EP will be re-released the same month. STRIKER recently posted a new song, “Forever”, helmed by legendary producer Michael Wagener (ACCEPT, METALLICA, OZZY OSBOURNE, DOKKEN). The track can be streamed in the YouTube clip below. DYING FETUS – Release New Album Teaser! DYING FETUS have released a teaser for their new album “Reign Supreme” online. The album is on course for a June 19th release date through Relapse. Go HERE to check it out. As Denver (USA) grind bandits CATHETER prepare to attack the planet with their third full-length album, Southwest Doom Violence, this week the savages at Stereokiller.com have posted a stream of the entire seventeen-track assault at the band’s official SK profile page RIGHT HERE. Den Headz, Billboard.biz are now reporting that Roadrunner Records founder/CEO Cees Wessels will be stepping down from the label. The move comes 17 months after its sale to Warner Music Group. While exact numbers were not revealed, apparently 36 employees worldwide were let go from the label. Sixteen staffers will lose their jobs at the U.S. branch of the label as it is realigned to use Warner Music Group‘s back-office, etc. services. The U.S. branch of the label will apparently continue to operate as standalone however for the most part. It was also mentioned that at least some staff are expected to be retained in all territories except the Netherlands branch of the label, which is being shuttered. Check out “Arise” at THIS LOCATION.